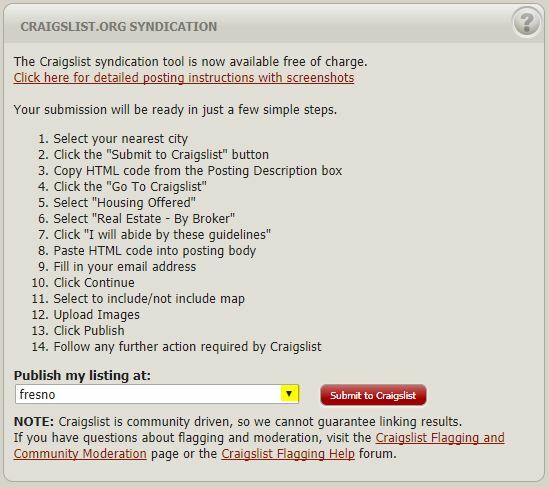 Click the tab on the left-hand side labeled “Syndication”, you may need to scroll down to see this tab. 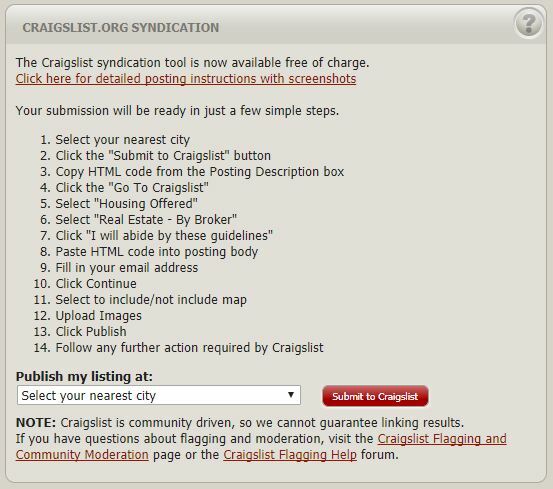 Scroll to the bottom of the page, you will see a section labeled “Craigslist.org Syndication”. 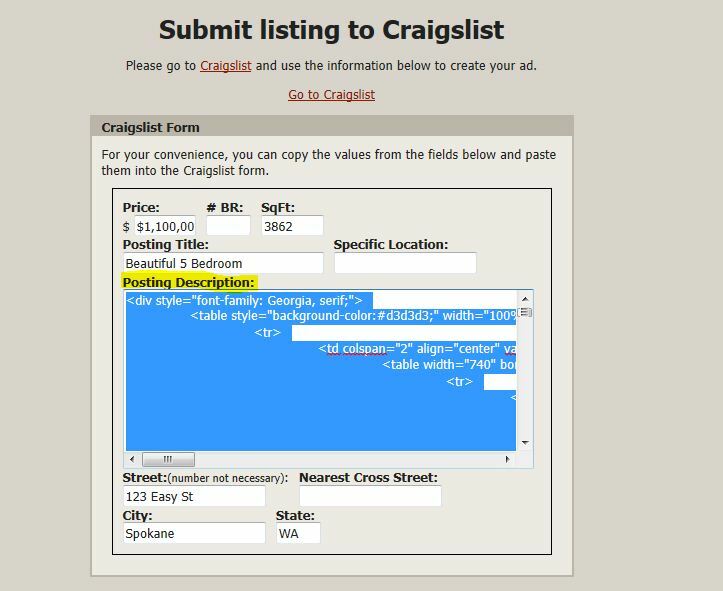 Choose the city you would like to post your Craigslist add to using the drop-down menu labeled “Publish my listing at:”. 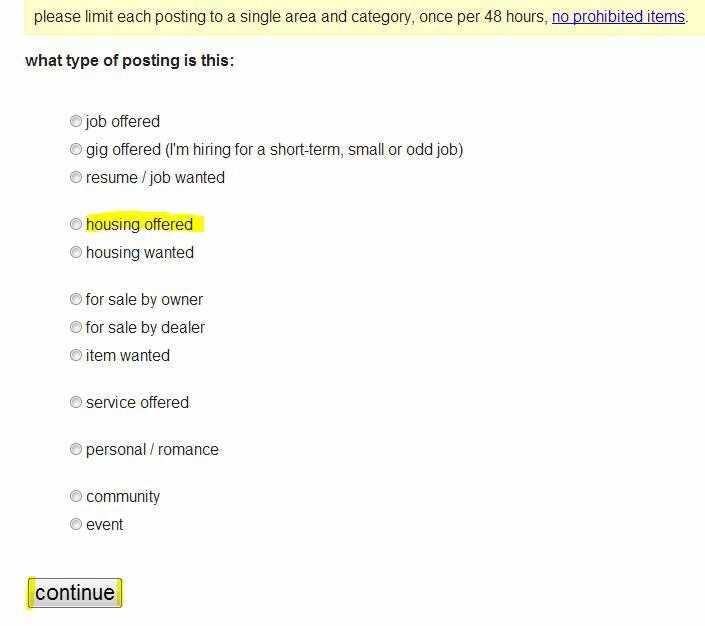 Click the “Submit to Craigslist” button. 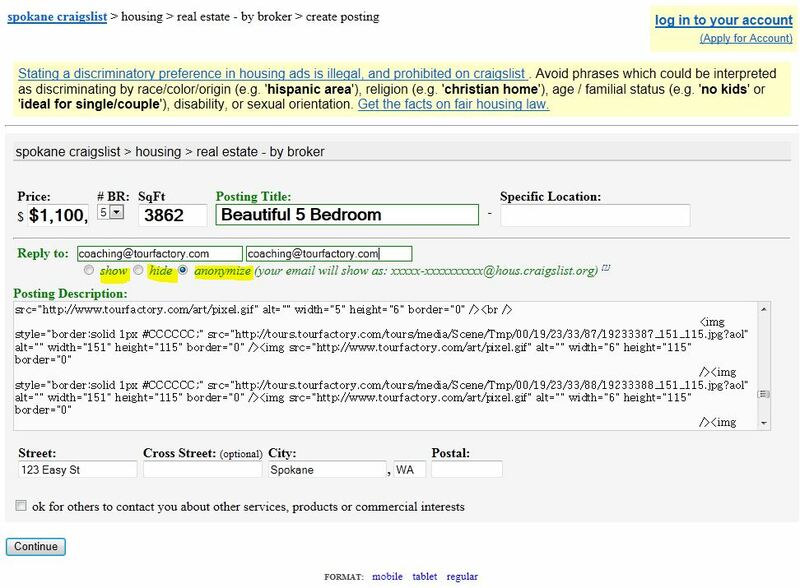 Note: Only the cities Craigslist has listed on their site will appear in the drop-down selection. A new window will open displaying your copy and paste template. Click in the box labeled “Posting Description”, all the HTML coding will become highlighted. Right-click on the highlighted text, and click “Copy”. 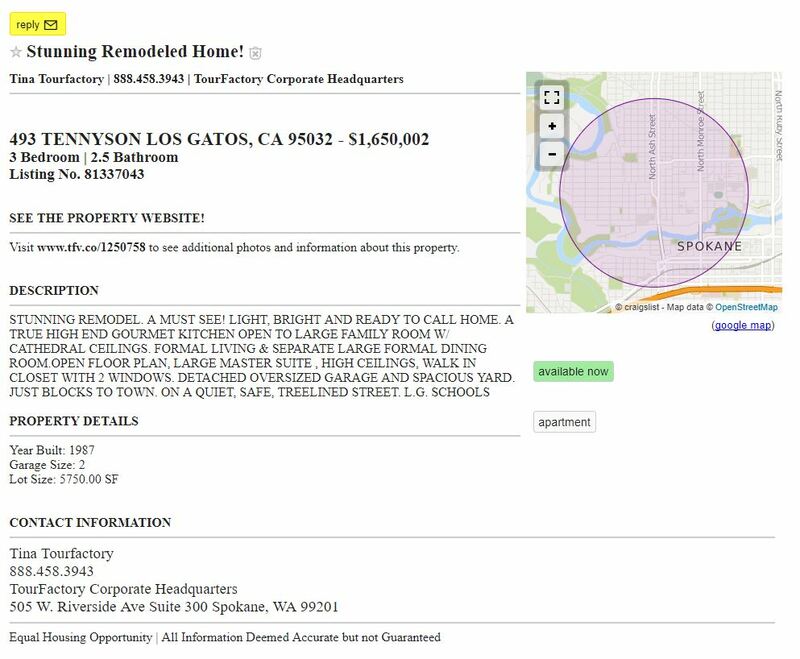 A new window has now opened with your blank Craigslist posting. Right-click in the white box under “Posting Description”, choose Paste. The HTML coding your copied will now appear in this box. Don’t worry your posting won’t be just coding, on the next page it will turn into a beautiful design! 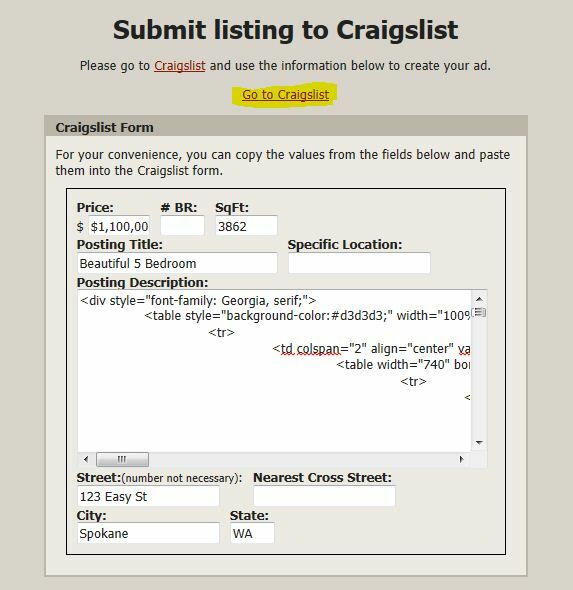 Return the window containing your Craigslist copy and paste template. 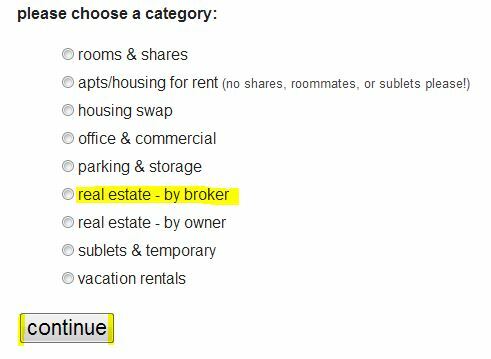 Repeat the above steps for each field you would like to copy to Craigslist. 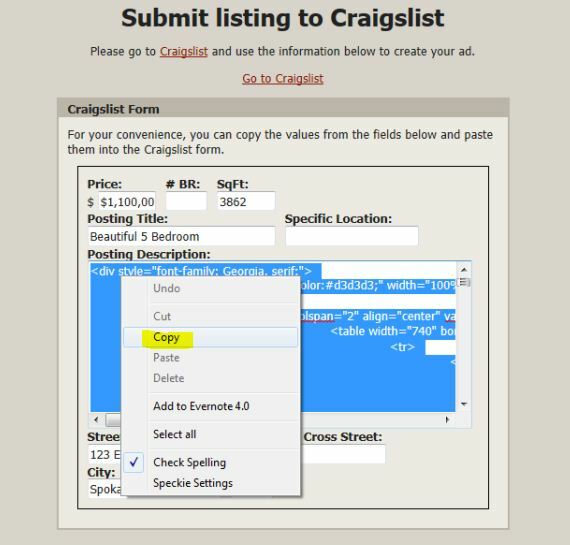 The field title on the template will match the field title on your Craigslist posting. The image below shows a colored dot next the matching fields. Click the image to enlarge it. Now that you have copied the fields you would like displayed on your posting, let’s fill out the rest of the required information. Enter your email address in the “Reply to:” fields. You’ll need to enter it twice for verification. 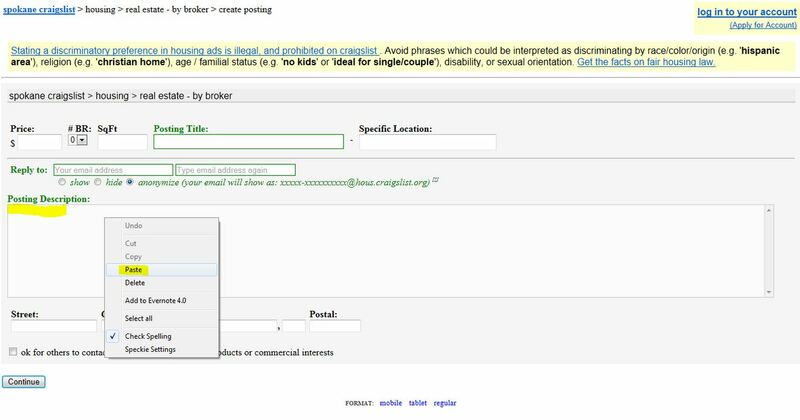 Under your email address, you will see three options: “show”, “hide”, and “anonymize”. If you choose “show”, anyone looking at the post will be able to see your email address. If you choose “hide”, nobody will be able to submit an email reply (not recommended). If you choose “anonymize”, your email address will be displayed as xxxxx-xxxxxxxxxx@hous.craigslist.org. 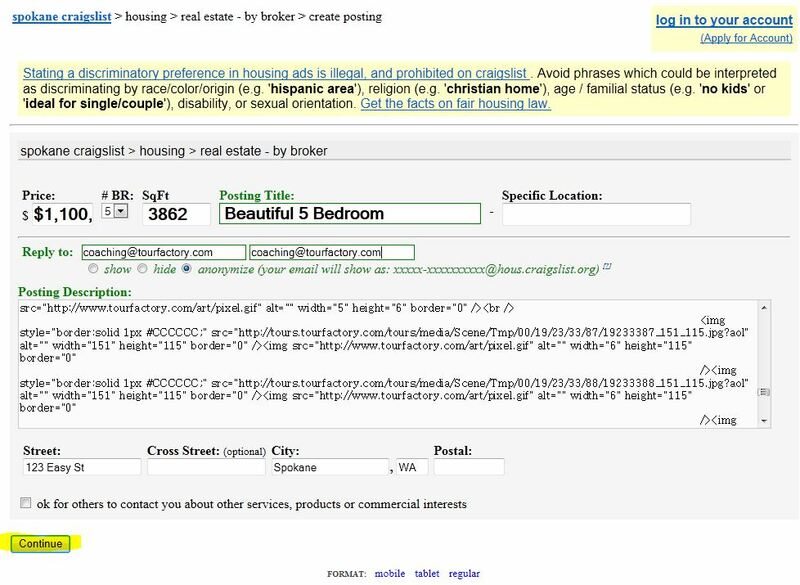 The “anonymize” option allows Craigslist to help filter spam emails from coming into your inbox. 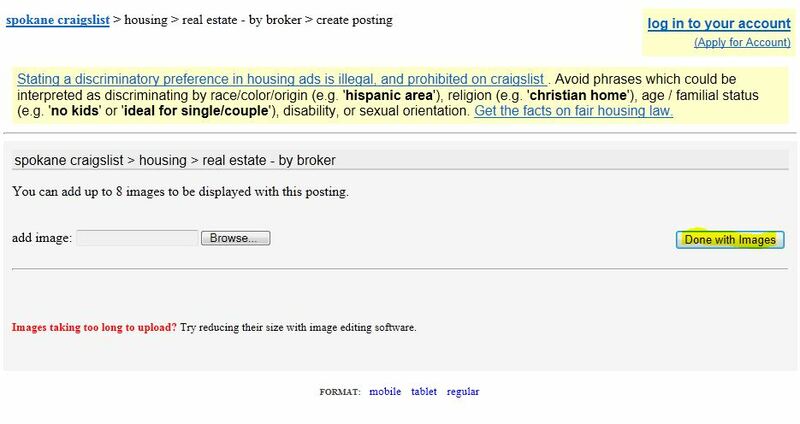 Most users choose “anonymize” when posting to Craigslist. The only required fields are “Posting Title”, “Reply To:”, and “Posting Description”. If you haven’t filled out all these fields, please do so now. The rest of the fields are optional, but for better results I recommend entering as much information as possible. Once you have filled in all the fields you would like, click “Continue”. 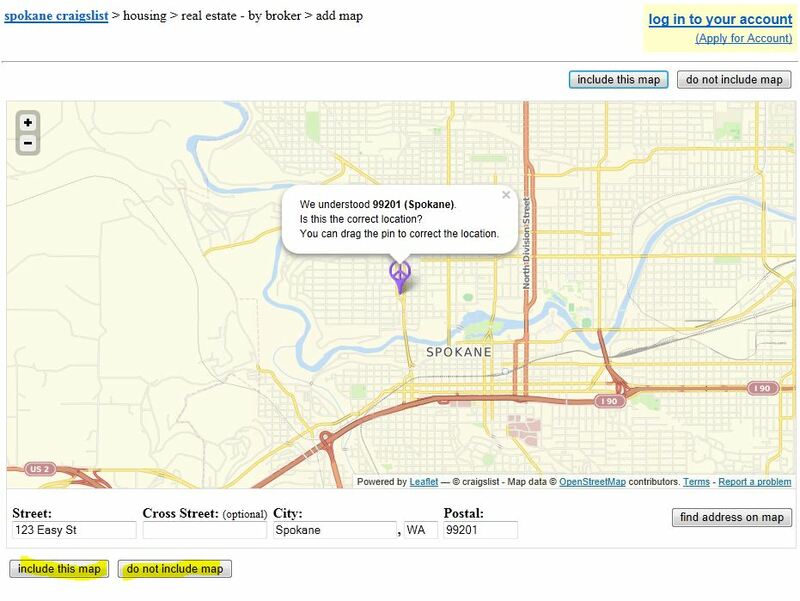 Choose if you would like to include a map provided by Craigslist by clicking the button labeled “include this map” or “do not include this map”. Select the images from your computer that you would like to include in your posting. Click “Done with Images”. You will now be presented with a preview of your Craigslist posting. Once you have reviewed the posting, scroll down and click the “Publish” button. 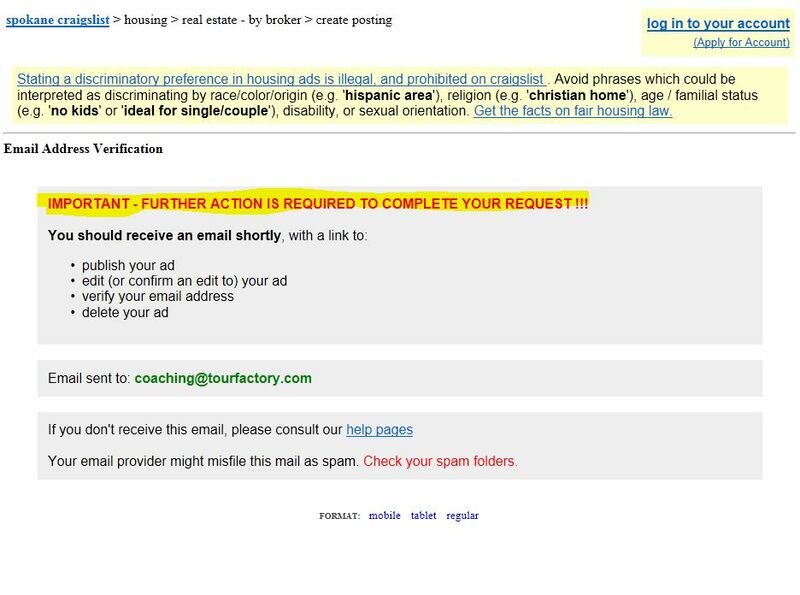 Check your email and click on the provided link from Craigslist to activate your posting.